In these Kohler faucet reviews, you will find the inside scoop on all things Kohler. From their trademarked special features to a bit of history and information on their community activism, all you need to consider this company is to kick back, relax and enjoy Faucet Mag’s reviews of Kohler’s most popular faucets. If you like our reviews, check out our top-rated faucets for our favorite picks in the faucet market. Also, we’d love to hear what you think!! Please leave us a message and let us know. The Kohler Bellera is a graceful ‘swan-neck’ style pull- down kitchen faucet. Learn more about this faucet here. 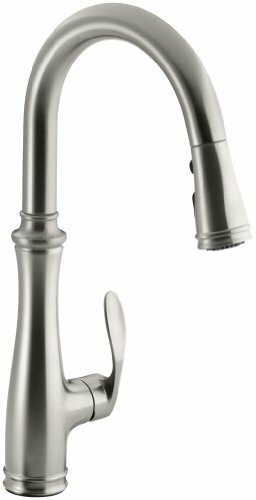 The Kohler Coralais is a single handle control pull- out faucet that is the most budget friendly faucet reviewed here. 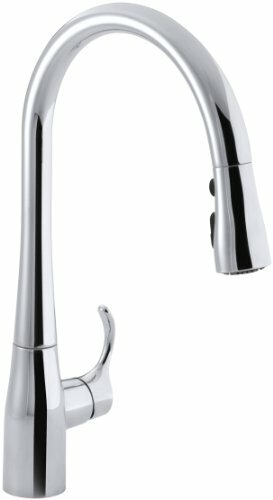 The Kohler Coralais single control pull-out faucet is by far the most family-friendly faucet Kohler has to offer. The first thing to notice about the Coralais is that it has a price tag that can be afforded into the family budget, which we at Faucet Mag understand is normally pretty tight. With it having the Kohler name and superior features to back it up, it is simply a great bargain. This faucet features temperature memory, which allows you to set it to a preferred temperature, turn it off, then turn it back on with the same temperature setting. This is perfect for moms who wish to set it at a consistent temperature and not have to sit at the faucet monitoring and adjusting the temperature until it is just right for baby bear (or the dishes). This faucet also gives you the ability to limit the high temperature. By setting it at a limit low enough to prevent scalds, it is safe to say that this is by far the safest sink to use (no pun intended). The number one complaint about this faucet is that the connector hoses are not long enough. The consensus is that they are about a foot in length, and if you need any more length than this you should a) consider another faucet or b) find the hoses necessary to compensate for this. With all of the features specific to this faucet, it is easy to be sold, so we would suggest taking measurements and purchasing the hoses necessary. With the low price tag, the additional purchase is certainly justified. A few others complained about the 1.7 gallons per minute flow rate. 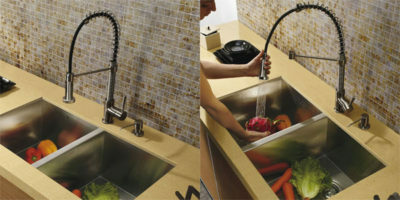 This feature is to conserve water and should be taken into consideration when considering this faucet. 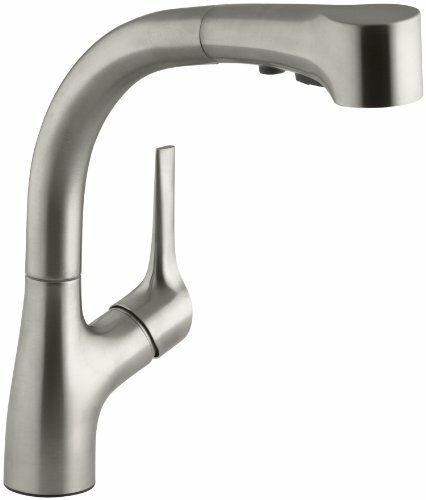 The Kohler Elate pull- out kitchen faucet is Kohler’s premier offering of the four reviewed here. This faucet has several very useful and functional features, along with a modern, almost subdued design that will mesh well with almost any style. The Kohler Elate Pull- Out Kitchen Faucet is a stunning pull- out faucet that blends design and functionality and tops it with an ergonomic sprayer that creates comfort and ease of use. It features a single side lever handle that allows you to control both temperature and flow with one hand, leaving your other hand free to hold the dish you are rinsing or filling. The high- arc swinging spout accommodates even very tall pots, but without the ‘gooseneck’ design that is common to these faucets. What the Elate has to offer instead is a sleek, modern style paired with the benefit of being easy to use. The three function sprayer has a spray and stream function that with a convenient switch located right on the sprayer. It also has a pause function for when you need to stop the spray for a moment. A common complaint about this faucet is that the spray and stream functions do not perform exactly as expected. Apparently, when the water pressure is set to a lower setting, water will come out in both spray and stream mode. This complaint was common when consumers wished to use the stream mode at a low setting. Others complained about the hose fraying, though one admittedly said that this could have been a problem with installation, as it was self- installed and the installer lacked experience. It is also reported that this faucet is not the easiest to install. There was also one report of a valve malfunctioning, but this seems to be more uncommon. 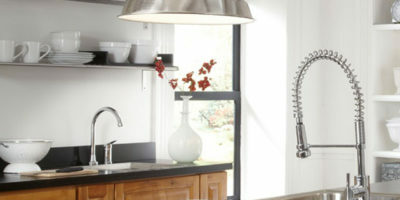 The Kohler Cuette pull- don faucet is a beautiful faucet with lots of features that match the beauty with functionality. The Kohler Cruette pull-down kitchen faucet has a long list of Kohler specific features, similar to the Bellera. 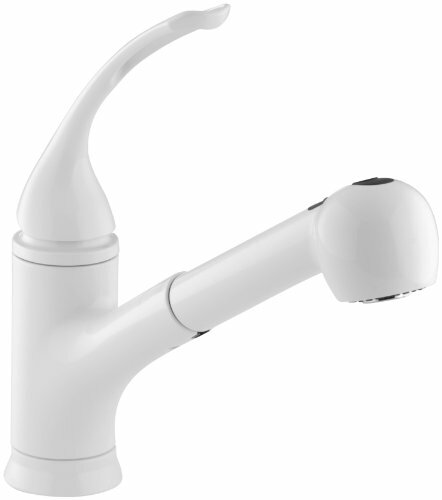 These faucets both feature a 360-degree swivel and ProMotion system that gives maximum reach and maneuverability. They both also have a high- arc spout to accommodate large pots under to wash or fill. Both have the DockNetik magnetic docking system and the MasterClean Sprayface that saves you time (and elbow grease). They also both have a three function sprayhead with the very useful Sweep spray function. The main difference between the Bellera and the Cruette is that the Cruette has a more rounded out base which balances the ‘swan- neck’ spot perfectly. It is closer to the teapot design than the Bellera. Unlike the Bellera, the Cruette is only suitable for one- or three- hole installation. If you have two or four holes, you may need additional parts in order to install this faucet. Some reported that this was an easy task, but others reported that it was extremely hard to install. It was claimed that the instructions are lacking, but there is a handy installation video you can look over to decide for yourself. Others complained about leaks, and even the button on the sprayer falling off. 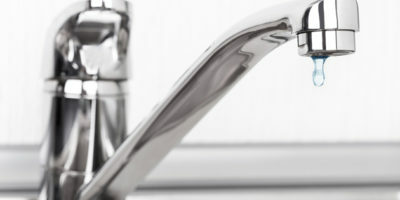 Kohler is stated to be quick with replacement parts, though, and it seems as if a lot of these leaks could have been prevented by reading the installation instructions carefully, or even watching the video if the instructions seem unclear. This particular faucet is one of the sleekest available on the market and will fit right in with numerous modern kitchens thanks to its 360° spray head and stain resistant polished chrome finish. The tap and integral design of the faucet is incredibly light at a little over 6 lbs meaning that anyone in your home can easily utilize it. Kohler boasts about “the bold look of Kohler’, and it is true that their faucets are very well designed and pleasing to the eye. 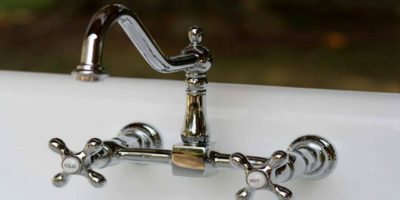 More important than the beauty of the products is the functionality, though, and Kohler also exceeds expectations in the technology they incorporate into their faucets. Whether you wish for an ergonomic design that makes the sprayer feel like an extension of your hand, or the maneuverability and quiet motion of the ProMotion system, thy have you covered. Kohler also has their very own trademarked Sweep sprayer setting, which creates a ‘blade’ of water to help sweep debris off dishes and sinks down the drain. With all of their faucets made of quality materials and backed by a limited lifetime warranty, the company assures that your investment in their product will pay off for years to come. Founded in 1873, Kohler has been providing plumbing fixtures and accessories for over a century. They have a rich company history and also give back to the communities they do business in. In Mexico, they irrigate a community soccer field with water leftover from the plant, promoting water conservation. In their ‘hometown’ of Kohler, Wisconson, they have designated a part of the parking lot and transformed it into a shared garden. They also host Harvest for the Hungry in their town. In India, they help support Mobile Creches, which is a program geared toward the young people of Dehli and other parts of India. With parents forced to work, many children find themselves without care or a place to be during the day. Mobile Creches trains Indian women to be caretakers of young children and also funds mobile daycares for on-site daycare at construction sites. They aim to provide workplace daycare to provide a safe nurturing place for children while their parents work to provide for them. Kohler is a well- known brand with an interesting history and strong community roots. Their products offer a design for every taste and technology for every need. Reviewed here are two mid-range pull-down faucets; the Bellera which has more installation options, and the Cruette which has a wider, more curved base that balances the swan neck well. There is also the family-friendly Coralais that has both temperature memory and the ability to limit the temperature to prevent accidental scalding. Last but certainly not least, there is the top- of- the- line Elate that is ergonomic and beautiful with the added bonus of a pause button on the sprayer. 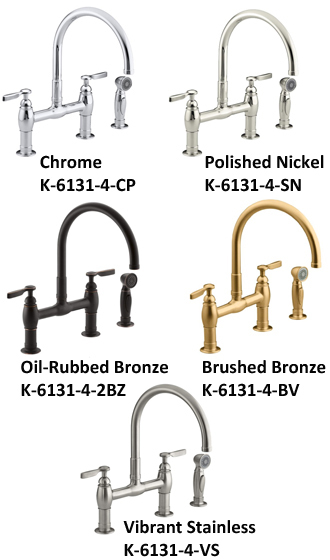 All of the faucets found in our Kohler faucet reviews can be found on Amazon for great prices with fast shipping.